Rather than a clash of cultures what lies at the heart of the building flash points is more of a cultural catastrophe, something that I have written on many times over the years, as over several decades many communities have settled in areas of Sheffield amongst other large cities, with most failing to integrate whilst wholly retaining their cultural identities and practices from their home countries that sows the seeds for future conflict in the ghettoised communities such as those referred to by David Blunkett. For instance muslim communities such as Bangladeshi's, Pakistanis' Indians, and North African's tend to attempt to follow the example of the times of the Prophet as an idealised way of how one should live in this life to gain access to paradise in the next life. Invariably this involves a high degree of control of the women in the families at least right up to the point of marriage, as women are forbidden to talk to those outside of the immediate family and therefore like low category prisoners are only let out on licence which should they break any of the terms of their families license will be treated as virtual house slaves to be imprisoned within the homes four walls that could result in the most extreme punishment of all which is to be forced into an arranged or more accurately deranged marriage with a relative from the parents country of origin. Whilst the act of taking ones daughter or in even some cases son's under duress to ones country of origin to marry a relative is rare occurrence i.e. probably less than 8% of arranged marriages are forced marriages, however it is the prevalent over hanging threat of what could befall any daughter who should step out of line is that which encourages manifestation of far greater religious observance amongst the second generation muslim immigrants (born in Britain) than that which the parents generation had themselves observed as they had in large part enjoyed freedom away from their parents and family when they first settled in Britain, however a freedom that they have subsequently chosen not to afford to their own children. 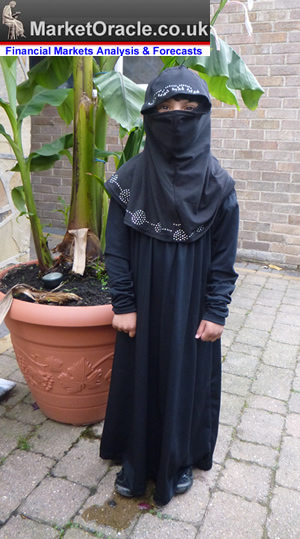 This is illustrated by the emergence of the burka or full veil that was virtually unknown to Britain 20 years ago but is now increasingly becoming commonplace across Britain, as younger and younger children are being indoctrinated towards strict religious adherence as a mechanism for total control of the next generation. 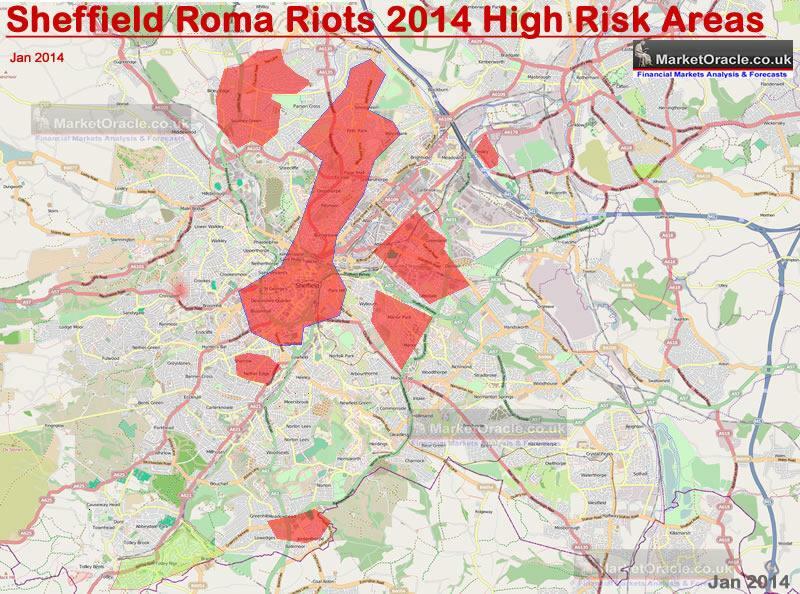 The flash points that are occurring today in places such as Sheffield are as a consequence of the Roma mass immigration as they tend to settle in high immigrant population areas which are predominately populated by muslims such as Pakistani's, Indians, Bangladeshi's and North Africans (Arab and Somali peoples), where such cultures including that of Sikh and hindus seek strict control over interaction between the sexes which is diametrically opposed to the behaviour of incoming Roma communities who have been conditioned through near 1000 years of being persecuted in countries such as Czechoslovakia, Romania, Bulgaria and elsewhere, constantly facing persecution and prejudice, denied equal rights and in fact slaves for much of their time in europe, no education and thus forced to live an meager existence on the margins of society in squalid make shift camps that are always at the risk of demolition, and having been long forced into a life of crime to survive, skills and practices that have been honed over many generations such as the passing down of the skills for pick pocketing from one generation to the next or worse still many Roma women are expected by their families to engage in prostitution as an acceptable means of putting food on the table therefore women are perceived in a completely opposite manner to that which most muslims perceive women. Therefore the vast majority of Roma communities in-effect operate as crime families which is why crime has and will continue to soar in the areas where the Roma are settling. Again after 1000 years of conditioning, crime is natural to the Roma communities that will take many generations to overcome and only then if they chose to associate themselves with the wider community. Therefore the people of Sheffield need to be prepared for a Roma crime wave during 2014 featuring a whole host of petty crime and scams such as the driveway cleaning / sealing scam where no sealing actually takes place as will soon become apparent when weeds start to emerge from between the paving bricks, which amounts to an expensive £100-£200 cleaning that would have paid for 2 or 3 pressure washers. And it is the expected crime / scam wave and diametrically opposed cultural catastrophe that sows the seeds for riots in many British cities such as in Sheffield BETWEEN immigrant communities as that is where the communities can be found to rub up against one another. The manifestation of the cultural catastrophe can be seen taking place now right across Britain as illustrated by the recent mainstream media story of the gang of Roma pedophiles preying on children in school play grounds in Peterborough, which is not an isolated incidence because it is cultural practice of dating back many centuries, which is why there is a high and growing risk of riots in cities such as Sheffield during the Summer of 2014, just as the Sheffield Labour MP David Blunkett warns. There is a huge cost to Britain not only in terms of breakdown of social order but also in terms of a heavy financial cost as the lack of identification with Britain manifest itself in the widespread perception that benefit and tax fraud against the state is acceptable as it is said to sanctioned as per interpretation of their respective religions, as religion supercedes English law, which manifests itself in many immigrants having assets such as properties and business on rent in their countries of origin for which they earn many £ thousands in rental income, none of which is declared in the UK as they seek to maximise benefits claimed and minimise taxes due in Britain, the consequences of which is contributing towards the £110 billion black hole in the governments annual budget deficit. The problem is as I have often voiced over the years that immigrant communities when arriving in Britain are not being educated on what is expected of them to live in a civilised society as many come from war torn chaotic areas such as Somalia or third world villages or crime infested shanty camps of Romania, therefore have no knowledge of how to behave in a far more civilised environment and thus manifest the same behaviours that were the norm in their countries of origin which as the examples of past migrations of Indians, Pakistanis and Bangladeshi's implies could continue for the whole of their lives, and so on in future generations. EDUCATION IS THE KEY - All migrants, of whatever country of origin need to be educated in all aspects of how one lives life in an civilised Britain, and that many of the cultural practices such as cultures of widespread criminality, treating women as second class citizens, and the more extremes of pedophilia that tends to be written into the scripts of ALL religions as being totally unacceptable in today's Britain. Until immigrants are able to demonstrate such knowledge and behaviour then they should not have any recourse to public funds or services. That is the only solution to Britain's cultural catastrophe as the monetary carrot is what encourages many to migrate to Britain in the first place so immigrants should be faced with the choice of undergoing the process of Britishisation and fully integrate rather than seek out to replicate the environment that they escaped from in the first place, coupled with free money from the British state that they would not be in receipt of in their countries of origin. Immigration and a lot of immigrants are hardworking and majority highly educated and can genuinely give something to Britain. The immigration problem however which is periodically spoken about isn't immigrants from outside the EU, the problem is from immigrants inside the EU, and more specifically Romanian immigrants. A serious discussion needs to be made because as it stands there are only 80,000 Romanians in the UK and the problem is quote visibly evident. 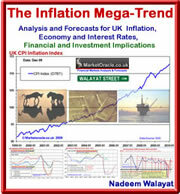 The UK is expected to have a influx of over 500,000 by 2015 which should ring alarm bells across government. Don't get me wrong if a Romanian is educated and will provide a specific service eg doctor/nurse/teachers/scientists etc all of which require a person being educated then fine but how does allowing a person or family who have no education and who hasn't ever sought this change anything? The Romany population cannot debate by saying opportunities weren't open to them in Romania. They have decided against it. So what makes them coming to the UK any different on the contrary by them entering you are restricting those with genuine skill sets from coming. It's not rocket science. The left always attack anyone who raises concerns - the problem is those concerns are usually logical and self-evident. As much as some would like it, many immigrants are just not suitable or desirable to our way of life, and the Roma are a prime example. There are no gains to us, only problems. In my experience in Spain and Ireland, it is the sending of women and children into the street to beg that is the single-most damaging factor to the Roma's reputation. If this degrading practice were stopped, then I think a lot of the ill-will towards them would diminish considerably. Bog off Blunkett - YOU, along with Blair, Brown, Straw created this mess. Trying to defuse the anger of the great British people by your typical leftie lecturing and bleating does not work anymore. The hypnotic spell ‘New Labour’ cast over us has been lifted, we are not afraid now to stand up for Britain even if you are, you cowards. Whether we are ‘racist’, ‘bigoted’ or ‘xenophobic’ is irrelevant and an idealistic load of student hype which has no place in the real world. YOU have enacted laws and policies which put immigrants, scroungers and dead beats before your own people and giving away OUR democracy and country to the EU. You have betrayed the spirit, lifestyle and values of the British people, now is the time for rebellion to reclaim our country from the likes of you. This is the biggest lie this government is responsible for. They keep saying they have got immigration down to 10's of thousands, but keep neglecting to tell everyone it doesnt include EU immigration. All EU citizens are allowed free access to Britain and ALL BENEFITS and from 1st January 2014 include Rumania and Bulgaria. Estimates vary from 1200 to 1500 a day and I suppose they've all got jobs because the Con's keep telling us it's good for the economy??? Bear in mind Rumania wants rid of the Roma Gypsy problem so we will have to have them. 18 Jan 14, 02:01 The UK Owes them NOTHING! I have said for years that civil unrest of unimaginable proportions is an inevitable consequence of the deliberate destruction of British culture. 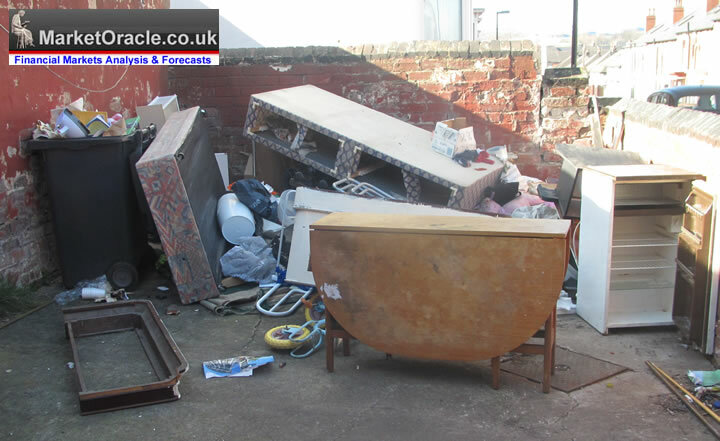 This destruction has been the policy of successive left leaning Labour, conservative and coalition governments. All mainstream parties have a hidden agenda to unravel a society that brought so much to the world over many centuries. This policy is a direct result of indoctrination by universities masquerading as venerable seats of learning. One must ask why Roma have been subjected to discrimination for centuries. It is because their lifestyle is in direct conflict with decent societies. The UK owes them NOTHING. This absurd policy of supplying them with sites and facilities at the taxpayer expense and turning a blind eye to the filth they generate must stop. It must be stopped by the political process or the people will once again take matters into their own hands. It is preferrable a civilised process be pursued with deadlines to remove them if they do not become full contributing members of British society. They have choices. If Britain or any other country is unwelcoming and "oppressive" then they can leave. It is their choice. It is the choice of the British people (not the political elite) to set whatever rules they like as to what is expected from anyone who wishes to reside in the country. The UK must take back its borders.